After reading the past two posts on competition and plastic surgery, some people asked me how those subjects relate to my work. So today, I wanted to share more of the story behind my work. 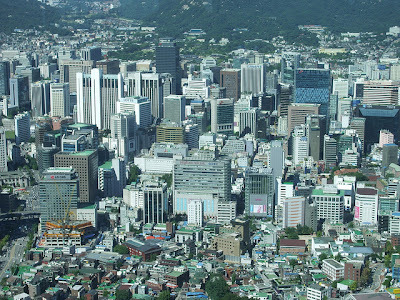 I was born and raised in Seoul, the metropolitan capital of Korea, teeming with a population of over ten million. 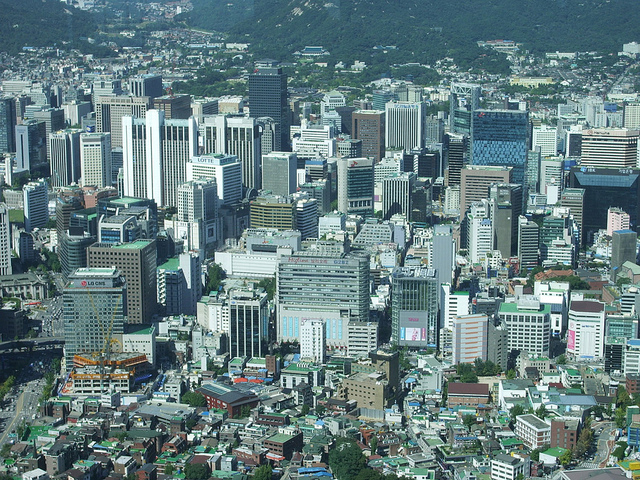 While Seoul is a beautiful city on the surface, what lies beneath is the seldom talked about presence of the cutthroat competition that permeates the culture. Immersed in competition, I was taught that recognition was the ultimate goal. My peers believed that scoring high on exams, and entering high-ranked universities were the only ways to gain recognition. For my female colleagues and I, competition didn’t end in academics. While I was too afraid of going under the knife, ten of my friends eventually went on to receive plastic surgery. They believed firmly that beauty affords greater probability of getting a good job or finding a successful husband: both effective ways to gain recognition. A similar desire to achieve beauty was the goal of my undergraduate artwork. I started each project with a clear vision of what each piece should look like. I then judged and valued my work based on how closely my production matched the design. I spent a long time filing, sanding, and polishing precious metals. I did not enjoy this process, but I felt that it was a small price to pay to achieve the beauty that I so desired. All this changed when I moved to Providence for graduate work. Living in a different city came as a shock. I was completely alone, and it was hard to meet people. The culture shock, the language barrier, and the workload all made it very difficult for me to feel at home. This image was taken by Yong Joo Kim. I then realized that without the cultural restrictions of home, I was able to explore my environments more freely. I didn’t know what the social norm was so I wasn’t pressured by it. With nobody to stare at, and nobody to be stared by, I started to dress down. Day by day, I felt the longing for beauty start to dissolve. In its place was now a new desire: a desire to explore the new environment, to understand, internalize, and to empathize. Through this process of exploration, I realized that the world is full of unnoticed objects. I found such objects beautiful. As I became interested in their potential, I began taking these mundane objects and evolving them into something new. Instead of my usual repertoire of precious metals, my choice of materials now came from the corners of our everyday lives. By assembling, grouping, clustering, and piling these small and simple elements, I learned something unexpected. What I have learned from this experience is that no matter how mundane or insignificant a material seemed, as long as the creative process was fueled by a firm belief in their potential, imbued with the desire to empathize, I was eventually surprised to discover that the material possessed qualities of beauty that I did not know existed. Perhaps this is where the idea of "inner-beauty" comes from. Rather than attempting to attain superficial qualities through means such as plastic surgery, what if we maintained a firm belief in ourselves, and searched for our own special qualities? As much as it sounds cliche, is there any reason not to believe that we won't be surprised to uncover qualities that we did not know existed? Couldn't such moments of surprise be the very motivation to keep searching for more? To give us a reason to wake up each morning? As the wearer approaches my work, I hope to give them these sudden and unexpected realizations that spark wonder, discovery, tension, joy, and play. My work introduces unconventional use of familiar artifacts into a world full of conventions. My journey into a new process of working has fundamentally changed my perspectives in life. The journey has only begun. A few days ago, I stumbled upon some images on Flickr.com. Here they are with translations. Translation: We will discover her hidden beauty. They are ridiculous copies, but I know how serious they are. Because they remind me of the time when i was in college. I wrote a blog posting about the subject of competition last month, and now I want to share with you my story about my time in college that I wrote in my thesis. When I became a college student, I quickly realized that the competition was not limited within the boundaries of academia. As my friends and I no longer had to wear uniforms or keep our hair a certain way, we started to converse more and more about the way we dressed and presented ourselves. Some of my friends even talked about their desire to look beautiful and perfect through surgery. Although they already looked beautiful to me, the plastic surgeons they had consulted called out imperfections that could be fixed. Ten of my classmates eventually went on to receive the recommended surgery. 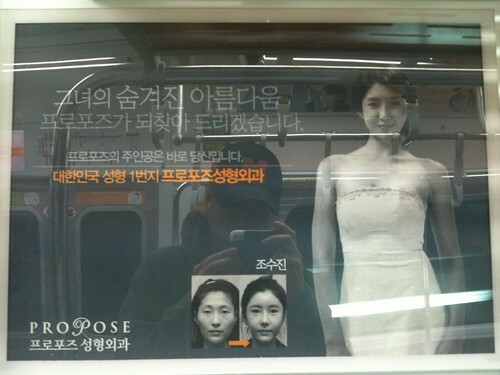 After the surgery, they started to visit the dermatologist every week to ensure perfect skin. Their obsession with beauty was not just a consequence of vanity. The underlying belief was that in a competitive society, beauty affords greater opportunities such as getting a good job or finding a good husband. The excessive pursuit of beauty continued throughout my college years. My friends and I talked about celebrities, fashion, and beauty all the time. I had to be aware of brand names simply to establish a common topic of conversation with my friends. Consumerism was rampant. We longed to have trendy, expensive products. I became very observant. On the street, I noticed people’s appearances — what kinds of clothes, bags, accessories, and shoes they had, and how beautiful they looked. Their belongings symbolized their wealth. I assumed and judged them through their appearances, and as a consequence, I was becoming a superficial person devoted to an artificial notion of beauty.